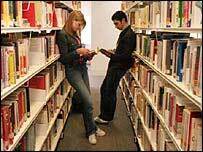 Scottish students leave university with fewer debts than their English counterparts, according to a survey. The Scottish Executive commissioned study found that students in Scotland left with an average £7,561 debt, and students in England with £8,062. Scottish students also had smaller incomes and smaller outgoings than their contemporaries south of the border, the researchers found. The SNP claimed that the true figure was higher than suggested. Nationalist politicians claimed that if the graduate endowment - currently £2,200, which students pay after they graduate - was added onto that, the average debt went up to £11,160. However, the report by Professor Claire Callender of London South Bank University and David Wilkinson of The Policy Studies Institute, showed that about half of students were exempt from paying the endowment. The academics found that Scots had £1,247 less in income than students from England, a figure which they attributed to lower household incomes and differences in student support policies and student profiles in England and Scotland. The average spending in Scotland of £2,168 was also lower than in England, with study results showing 20% of English students had total spending of at least £12,000, but only 3% of students north of the border had that level. Higher living and housing costs in England accounted for much of the difference, said the report. Fiona Hyslop, SNP education spokeswoman, said the level of student debt was unacceptable. "This is further evidence that it's time for a complete overhaul of the system," she added. "An SNP government will abolish student loans and replace them with grants. "We will also remove the burden of student loan debt for Scottish-domiciled graduates, debt that holds so many young people back from taking entrepreneurial risks and getting on the housing ladder."